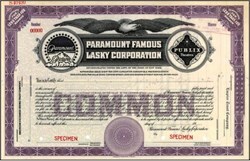 Beautifully engraved SPECIMEN certificate from the Paramount Famous Lasky Corporation. This historic document was printed by the American Banknote Company around 1921 and has an ornate border around it with with a vignette of an eagle with the famous Paramount and Publix Theatres' logos. Paramount Pictures began its operations in 1912 as the Famous Players Film Company, and was founded by Adolph Zukor (1873-1976). Adolph Zukor was born in in Austria-Hungary and came to New York when he was 15 years old. He started in the fur business in Chicago where he entered the new film entertainment business by buying a nickelodeon in 1903. Two years later, Zukor had a business partner named Marcus Loew. Shortly thereafter, Zukor became the treasurer for Loew's growing chain of movie theaters. With profits from a film distribution deal, Zukor branched out on his own to found the Famous Players studio. It was Zukor who then hired Famous Players' key to success, a young actress named Mary Pickford. She was soon known as "America's Sweetheart." In 1916 Famous Players merged with Jesse L. Lasky's Feature Play Company to form Famous Players-Lasky Corporation. (Lasky's partners were Samuel Goldfish [later Goldwyn] and Cecil B. DeMille.) After several more name changes, mergers, management shuffles, and a bankruptcy, the newly reorganized Paramount Pictures, Inc. emerged in 1935. In the 1930s and '40s, Paramount was known for its big stars: Bing Crosby, Bob Hope, Dorothy Lamour, Ray Milland, Marlene Dietrich, Maurice Chevalier, and the Marx brothers. Paramount became involved with anti trust problems began when the Federal Trade Commission investigated block booking in 1921. In a complaint filed on August 30 of that year, the FTC charged Famous Players-Lasky with restraint of trade by forcing exhibitors to buy unwanted films. Though the case focused on block booking, the investigation also brought studio-ownership of theaters under fire, and accused Famous Players-Lasky of using theater acquisition to intimidate exhibitors into block booking arrangements for Paramount movies. After 17,000 pages of testimony and 15,000 pages of exhibits, the FTC concluded in 1927 that block booking was indeed an unfair trade practice. The case Federal Trade Commission v. Famous Players-Lasky Corporation, et al resulted in a cease and desist order for block booking on July 9, 1927, as well as a demand for reform on Paramount theater purchasing. The three respondents �Famous Players-Lasky Corporation, Adolph Zukor, and Jesse L. Lasky� were given 60 days to comply with the findings. Paramount debuted its wide-screen VistaVision in 1954 to compete with Fox's CinemaScope. The 1950s were good to Paramount. Popular stars and well-known directors made the Paramount logo very familiar to moviegoers. The studio became a subsidiary of the Gulf + Western conglomerate in 1966. A bitter takeover struggle between QVC and Viacom in 1993 ended with Paramount becoming part of the Viacom Corporation. 1912 - Adolph Zukor founds the Famous Players Film Company. 1914 - First feature film made in Hollywood, The Squaw Man by Paramount precursor Feature Play Co.
1916 - Zukor becomes president of the Famous Players-Lasky Corp. merger. 1927 - New company name is Paramount Famous Lasky Corporation. 1930 - Name change: Paramount Publix Corporation. 1935 - Paramount Publix Corp. goes bankrupt. Reorganized as Paramount Pictures, Inc. under Adolph Zukor. 1940s & '50s - Prestigious reputation with directors DeMille, Hitchcock, Sturges, Wilder, and Wyler. 1970s - Big hits with "Grease" and "Saturday Night Fever." 1976 - Adolph Zukor dies at age 103.